At the forefront of driving the global renal denervation (RDN) devices market is the rising cases of hypertension particularly among the urban denizens. This is because renal sympathetic nerves are affected directly by hypertension. Another factor serving to boost the global renal denervation (RDN) market is the growing pool of elderly and emergence of better RDN devices. However, one problem besetting the global renal denervation devices market is the inadequate clinical data which creates hurdles in getting approvals from regulatory bodies for new products. This is somewhat hampering the market growth at present. Leading players with means have nonetheless managed to get approvals for their products because of their cutting-edge research and development facilities innovating on existing products. So far, just five devices have managed to get a regulatory nod for usage. They are now CE certified. At present, the global renal denervation devices market is consolidated with leading player Medtronic holding most of the share in it. In the near future, the market might see new entrants denting shares of established players. A report on the global renal denervation devices market finds that it is rising at a phenomenal CAGR and would likely pull in a value of US$1.9 bn by 2021. Technology-wise, the key segments of the global renal denervation devices market are renal sympathetic denervation procedure, ultrasound- based renal denervation systems, micro-infusion catheter-based renal denervation systems, and radiofrequency-based renal denervation systems. Among them, currently, the radiofrequency-based RDN devices holds maximum share in the market. This is because of the advantages it accords. Those include safety and time-efficiency. Some of the key products available in the global renal denervation devices market are Boston Scientific's (Vessix Vascular) V2, ReCor Medical's Paradise, St. Jude's EnlighHTN, Medtronic's Symplicity, and Covidien's OneShot. While Medtronic’s Symplicity held an outsize share in overall sales in the market a while back, newer products are giving it tough competition these days. Geographically, the global renal denervation devices market is spread across North America, Asia Pacific, Europe, and the Rest of the World. Among them, Europe at present holds the tag of both the biggest and fastest growing market. The region is seeing double digit growth. North America is another key renal denervation devices market which is witnessing solid growth owing to the FDA approvals of new products. Rising occurrence of cardiovascular diseases in the region too is having a positive impact on demand. Meanwhile, the Asia Pacific renal denervation market is also showing a lot of promise. This is mainly because of the high occurrence of diabetes which is boosting demand in the regions. Developing economies of India and China are main drivers of the region’s market growth because of their large populations. Some of the prominent participants in the global renal denervation devices market are Kona Medical, Medtronic Inc., St. Jude Medical, Boston Scientific Corporation, Mercator Medsystems, Covidien PLC, and CardioSonic. Renal denervation involves a minimally invasive procedure for the treatment of hypertension that is resistant to drugs or other medical treatment. As per a study published by the National Health and Nutrition Examination Survey, the prevalence of hypertension in the U.S. is approximately 30%. Clinical studies further reveal that 15% of hypertensive people have treatment resistant hypertension. This exhibits a positive outlook for renal denervation (RDN) procedures as it helps to normalize the blood pressure among patients with treatment resistant hypertension. The report on the renal denervation devices market is segmented on the basis of technology, product, and region. Radiofrequency-based RDN devices display substantial demand due to benefits of efficiency and safety. The report presents a quantitative and qualitative critical analysis of the global renal denervation devices market based on vital market indicators such as demand drivers, restraints, and growth opportunities. Each and every segment is carefully analyzed employing standard analytical tools to present its growth trajectory and market share projections. Rising incidence of hypertension among the urban population has been a significant growth driver for the global renal denervation devices market. RDN procedure offer benefits such as shorter treatment time and permanent cure over drug treatment, which reduces the overall cost of treatment in the long run. Thereby accelerating the market’s growth. Furthermore, awareness of RDN procedure and product approvals from FDA is likely to favor the RDN devices market. Hypertension involves directly impacting the renal sympathetic nerves. The increasing prevalence of uncontrolled hypertension and treatment resistant hypertension are some other key factors contributing to the market’s growth. Long lasting effect and shorter treatment duration of renal denervation procedure are likely to positively reflect on the RDN devices market. Further, rapid upgrade of RDN devices and a rising geriatric population globally are likely to bode well for the global renal denervation devices market. However, inadequate data pertaining to the efficacy of RDN procedure is challenging the market’s growth. Lower awareness of RDN procedure over drug based therapy along with lack of favorable reimbursement policies for RDN procedure accounts for slow uptake. Currently, Europe holds the top rank among other key markets for renal denervation devices market. Expanding at a double-digit growth rate, the region is anticipated to hold on to its dominant position through the forecast period. North America RDN devices market could accelerate on the back of product approvals from FDA in the next 4-5 years along with an increasing incidence of cardiovascular diseases. Nonetheless, Asia Pacific could emerge as a lucrative market for RDN devices market due to a growing aging population with high incidence of diabetes, of which a large percentage of the population that has not even received a diagnosis. Further, a large population of hypertensive patients in the region that have not been diagnosed with drug or treatment resistant hypertension, and are trying several alternate therapies and medications for a remedy for the condition. 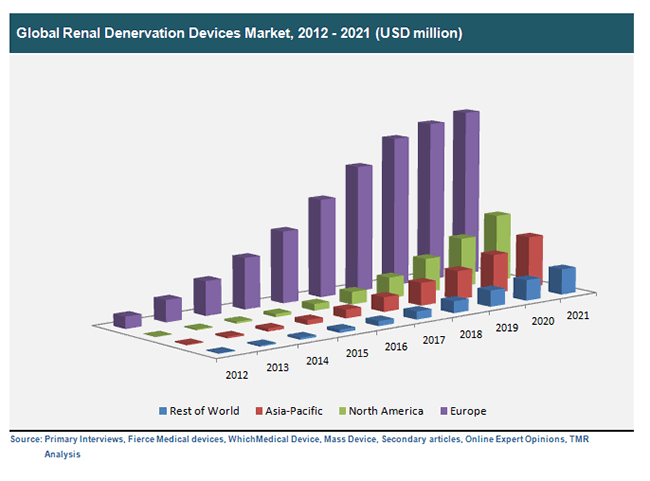 The renal denervation devices market is oligopolistic in nature with more than 85% market share held by Medtronic. Stringent regulations and long hauls for product approvals limit the number of vendors in this market. Currently, only five devices have received CE mark certification, which includes Boston Scientific’s V2, Covidien’s OneShot, St. Jude’s EnligHTN, and Recor Medical’s Paradise with none of the devices obtaining US FDA approval. However, the market is anticipated to witness the entry of new players to offer innovative products with reduced procedure time and greater efficacy.